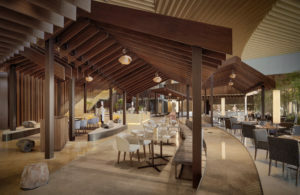 Hyatt has opened its first Hyatt Regency-branded property in China’s capital city. The 348-key Hyatt Regency Beijing Wangjing has a total of 60,277 square feet of meeting/event space, including a 14,746-square-foot ballroom. The property is located in the heart of the Wangjing Central Business District, and is easily accessed via the Airport Express. It is also close to the 798 Art District and the Futong subway station on Line 14. The hip Nanluoguxiang Street, the nightlife hub of Sanlitun, Olympic Park and other popular sightseeing and lifestyle destinations can be easily reached on the city’s underground transportation system. 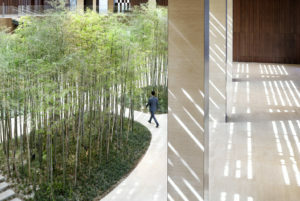 Designed by award-winning architect Kengo Kuma, the hotel’s architecture is inspired by the Chinese “Sanhe Yuan,” a three-sided courtyard style home embracing a green garden. With its location between green parks, Kengo Kuma has created an “urban forest” defined by a contemporary chic design and natural materials. and oak wood, beige marble, green marble and wood-grain patterned carpets in the guestrooms. and The Music Bar (cocktails, live musicians and DJs).